They’re like other no bake cookie recipes made with cereal, but with a couple of fun twists. 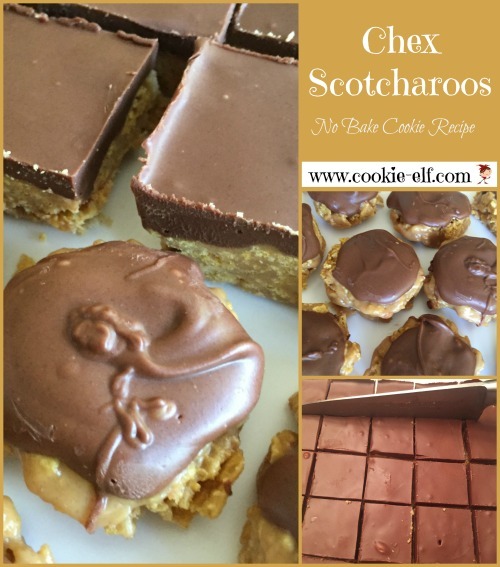 First, you can make the Scotcharoos as a bar cookie OR a drop cookie. How cool is that? Make the cookies with Chex cereal, so-named for its checkerboard pattern, which has been around since 1937. Measure Chex cereal and pour it into a large mixing bowl (here are some of our favorite mixing bowls.) Set it aside. Line a 13 x 9 baking pan with waxed paper, allowing it to extend over the ends. Or if you plan to make drop cookies, line a baking sheet with waxed paper. Set baking pan or baking sheet aside. In a medium saucepan, combine the corn syrup and granulated sugar over medium heat. Cook, stirring regularly, until the mixture comes to a boil. Remove the pan from the heat. Add 1 ½ cups peanut butter, stirring until the mixture is smooth. Pour the mixture over the cereal, stirring thoroughly to coat the cereal. Press mixture into the prepared baking pan if you’re making bars. Or use a large cookie scoop or 1/8 or 1/4 measuring cup to drop cereal dollops onto line baking sheets, and then with your fingers press drop cookies together firmly to form them. In a microwave-safe bowl, combine semi-sweet chips and butterscotch chips. Cook on high for two 30-second intervals, stirring in between. When chips begin to soften, add ½ cup peanut butter and cook for 20 second intervals, stirring in between until the mixture is smooth. Pour the melted chocolate over bar cookies and use a knife or an angled spatula to spread chocolate evenly over bars. Or if you’re making drop cookies, spoon the mixture onto each cookie as you would for frosting. Allow cookie to cool completely. You can set them in the refrigerator for 15-30 minutes or longer to chill faster. To cut bar cookies, remove them from the pan by grasping the waxed paper ends, lifting them out., and setting them on a cutting board. Peel away waxed paper. Use a sharp knife to cut bars into 1 ½ inch squares. Store the Chex Scotcharoos in an airtight container, placing waxed paper in between layers. While the traditional Scotcharoos recipe calls for Corn Chex, you can use any type of Chex brand cereal in this recipe. You may also wish to substitute crisp rice cereal (like Rice Krispies) for Chex. Use a microwave-safe 4-cup measure or other microwave-safe bowl with a spout to melt the chocolate chips, butterscotch chips, and peanut butter for the topping. This way, you can simply pour the topping onto the cookies or spoon it easily and save mess. For completely gluten-free recipe, use Hershey’s brand butterscotch chips. Get more easy no-bake cookie recipes on our Pinterest board.